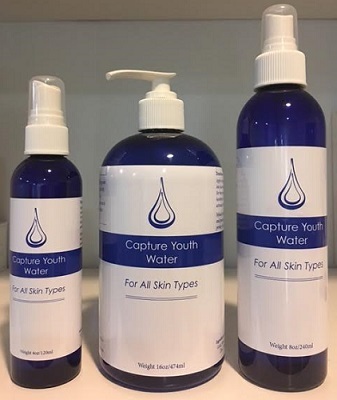 Capture Youth Water is so easy to use and does such amazing changes to the skin. Make sure you saturate the face with water. Then you want to massage it into the skin. If you blow it dry with a hair dryer, you will see even more results. It appears to help with firming, toning, lifting, improves the look of crepey skin around the eyes. Firms the neck and improves the look of the chest area. All natural spring water. It contains natural trace minerals of Platinum, Gold, Copper, Magnesium and Zinc. I saw a great difference around my eyes, neck and firmness. If I use the water only, and not other products, I see such healing on my face. It appears to help with pigmentation, and lessens the redness in the skin. Capture Youth Water comes in 3 sizes. ASAP Masque by Fanie Int.